IT was a very hot day. A monkey was walking by the riverside. He was very thirsty and hungry. He took some water and drank it. He was very happy. Then, he saw some banana trees. But they were across the river. The monkey could not swim so he was thinking very hard. Suddenly, "Aha!" said the monkey. He had an idea. Not far from him, a buffalo was drinking some water in the river. He came closer to the buffalo and told him his plan. "Hello, Mr Buffalo. Are you hungry?" "Yes, I am. I really want to eat some grass," said the buffalo. "I know a place where you can eat a lot of grass. It is across the river." "I know that place. It's a field. A farmer owns it. He will be angry if I eat the grass on his field," said the buffalo. "You are right. He is angry if he sees you eating the grass. If he does not see you, he won't be angry, right?" the monkey kept on persuading the buffalo. "Come on! Let's go now. We just have to be quiet and do not make noise," said the monkey. Actually, he wanted to trick the buffalo. He wanted to sit on the buffalo's back while they were crossing the river. "Ok then. But promise you won't be noisy," said the buffalo. The monkey immediately jumped on the buffalo's back. The buffalo's body was big. He did not have problem in crossing the river. After a while, they arrived at the farmer's field. Both of them immediately ate. "Mr Buffalo, I'm already full. Let's go back," said the monkey. "But I'm not full yet. Wait for a moment." The monkey was impatient. He was thinking how he could ask the buffalo to go back across the river. Then he had an idea. He made a lot of noise. It was very loud! The farmer heard the noise and he approached them. When he saw two animals were eating on his field, the farmer threw some stones. One big stone hit the buffalo's head. The buffalo's cried in pain. He immediately ran to the river. The monkey followed him and jumped on the buffalo's back. "Why did you make a lot of noise? You promised to keep quiet!" said the buffalo while they were crossing the river. "Now, I want to take a bath here. I want to clean up my wound." "But I cannot swim. If you take a bath here, I will be drawn," the monkey was panic. "I don't care. You made me bleed." The buffalo then rolled over his body. A subspecies Hose's langur (Presbytis hosei) called Miller's grizzled langur or Dracula Monkey is a species of primate in the family Cercopithecidae. It is endemic to the island of Borneo, including Brunei, Kalimantan (Indonesia), and East Malaysia. Its natural habitat is subtropical or tropical dry forests. It is threatened by habitat loss. It was first identified in Kutai National Park and Sangkulirang Peninsula, East Kalimantan, Indonesia, in 1985. 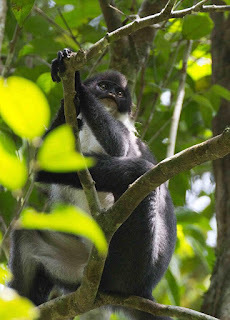 Miller's grizzled langur, a subspecies, is very rare and had been thought to be extinct, until the press announced in January 2012 its "rediscovery".